Picking the winning readers coupons.... From right: D.M.P.A. Dassanayake (AGM Technical, ANCL), S. Nimal Dharmasiri (Head of Tel. 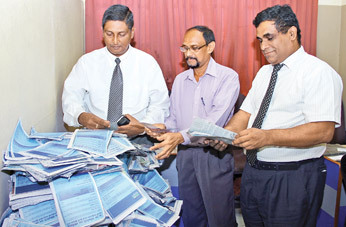 Systems & Maintenance) and Subash Karunarathne (AGM Web-Marketing) picking the winning coupons at the end of Count No. 17. Picture by Susantha Wijegunesekera. 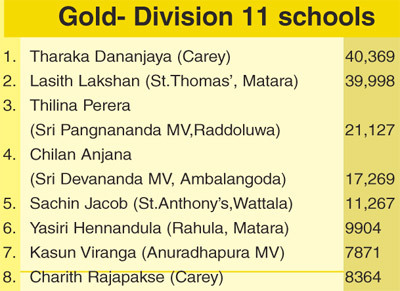 In the ‘Gold’ for division 11 schools last week’s winner Lasith Lakshan from St.Thomas’, Matara was pushed down to the number two spot as Carey’s Tharaka Danajaya occupied the top spot. 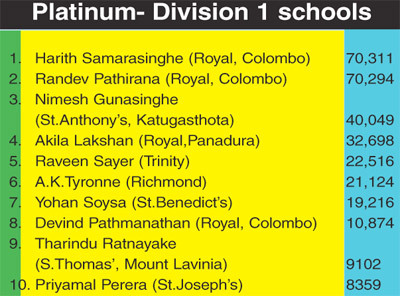 The majority between Lakshan and Dananjaya was 371 votes. 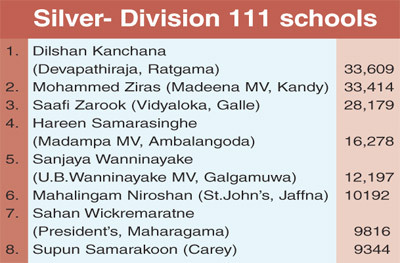 In the ‘Silver’ segment for division 111 schools Mohammed Ziras of Madeena MV, Kandy who was placed first last week dropped down to the second place as Dilshan Kanchana of Devapatrhiraja, Ratgama took the center by polling 33,609 votes to Ziras’ 33,414 a majority of 195 votes.